Have you finally opened that small business you’ve always dreamed of? Chances are you opened an online store to meet the needs of your customers. While this is a great step to take to widen your influence and get more customers, it can make things a little trickier. You’ll now have to worry about packing and shipping your products to people all over the country, or even all over the world. The good news is that learning about eCommerce shipping doesn’t have to be so hard. With a few simple tips, you can take full advantage of your online store without breaking your budget. Do you want to know more? Keep reading for your guide to eCommerce shipping for small businesses. Alright, so before you can even start to think about shipping your products, you’ll have to think about what company you’ll use to do that. Many people automatically think of big names, like UPS and FedEx, to do the job, but these aren’t always the best choices. For one, they tend to be a lot more expensive than smaller delivery companies. When you’re running a small business with thin profit margins, this is huge. Instead, go with a smaller courier service, like Need it Now Delivers. They offer the same services for a fraction of the price. Once you have your courier service picked out, you can start shipping those packages. But, you’re partly responsible for making sure your products get to their destination in one piece. Packing is an important part of offering eCommerce shipping. Make sure you choose an appropriate box. Using one that’s too big will leave a lot of extra room for your products to move around in transit and potentially break. It may also cause you to incur higher fees since you’re using a bigger box. Decide what box (or envelope) is best for each product. If you plan on selling and shipping a lot of products, you may want to buy these in bulk ahead of time, so you always have the right packages on hand. You’ll also want to include foam padding or fillers in your packages for extra protection. While this may not be important for things like clothing, it’s crucial for anything breakable, like ceramic mugs or glass pieces. So, let’s say your online store has been open for a while, but you still aren’t getting as many orders as you’d like. Offering free shipping can be a great way to get more people purchasing your products. We know what you’re thinking, “I’m barely making any money as it is – I’ll go broke if I offer free shipping!” But, offering free shipping doesn’t necessarily mean you have to cover the costs. You can increase product prices to cover the cost of shipping. Customers will think they’re getting an added bonus and you won’t have to pay a dime. It’s no secret that you’ll have competition when you open your business. But one of your biggest competitors will be Amazon.com. They sell just about everything you can think of and offer Amazon Prime, where members can get unlimited free 2-day shipping on purchases for a monthly fee. Even with the free 2-day shipping options, some buyers still pay extra to get their packages even faster. The days of waiting 7-10 business days for your package are dwindling away. If you aren’t offering faster delivery times, you’re probably losing out on potential customers. In fact, 49% of shoppers say they’re more likely to shop online if a store offers same day delivery. Over half of these customers are willing to pay extra if it means getting their package faster. This means you can charge more for same day delivery and still get additional customers. You’ll just have to find the right courier service to meet this need and make sure you’re ready to pack and ship your products right away. Think about the last time you ordered something online. If it was something you needed quickly or just something you wanted really badly, you were probably impatiently waiting for it to arrive. Giving your customers the ability to track your packages has benefits on both ends. First, your customers will appreciate knowing when their packages will arrive. But, it’s also good for you to be able to track your products. If your products arrive late or don’t arrive at all, you can look at the tracking and see what went wrong. Maybe there was a storm that caused delays or maybe the package wasn’t due to arrive until tomorrow. Having this information at your fingertips allows you to better serve your customers. You can apologize in advance and keep them informed if you catch this mishap before they do, or you can assure them that their package will arrive by a certain date if they call to complain. Sometimes things go wrong even with careful planning and the best courier services. 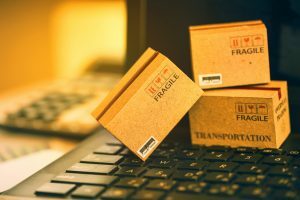 Your package may get lost, damaged, or even stolen before it reaches your customer. If you regularly ship expensive products, you’ll want to protect yourself in case this happens. Getting insurance is the best way to ensure you won’t be out $500 because that gold necklace got stolen off their front porch. If you want to stay on top of the latest buying trends, you’ll want to sell your products online. Just make sure you follow our guide to eCommerce shipping to ensure your profits rise and your customers are happy. Are you looking for the perfect courier to deliver your products? Contact us today for more information. Transportation and Logistics: Are They One and the Same?